I am so excited to be a stop on Connie Malamed’s blog book tour. She already has one great book so I was anxiously waiting for her next one. It is awesome, filled with great advice for those of us who are visually challenged. This book contains all kinds of great tips and techniques for creating exciting and visually appealing eLearning. Connie is passionate about the field of L&D and is founder of the popular blog The eLearning Coach. She also has created an App for ID folks and does a regular podcast…one thing she apparently doesn’t do is sleep. So for this stop on her tour, I decided to ask her a few questions about her new book. Kapp: First, you’ve got a great new book “Visual Design Solutions” (thanks for the advanced copy). Can you tell me why you decided to write this book? Malamed: Learning materials often rely on visuals to transmit information. eLearning courses, training and presentation slides, and learning portals are visual mediums. In addition, we use more brain resources to process visual information than we do to process input from any other sense. As such, the quality of the visuals greatly impacts the user experience and the learning experience. Yet too often, learning materials are designed randomly, because very few people in our field have an opportunity to systematically improve their skills in visual design. Furthermore, most visual design books focus on things like advertising, logos and brochures. I felt that it was important to have a visual design book for our industry—for learning professionals. I wrote the book to fill both of these gaps. Kapp: Why do you think visual design is so important for the field of instructional designer? Malamed: Visual design is important on several levels. Within the first few seconds of seeing learning materials, the visual component creates an impression. If it looks sloppy or poorly designed, it will negatively affect a person’s attitude toward the instruction. People have an inherent or learned sense of beauty, and if the design is not aesthetically appealing, it’s a turn-off. Also, relevant graphics are an important element for facilitating comprehension and reducing cognitive load. Because visuals can be processed in parallel, they can reduce the effort required to understand concepts, theories and ideas. Malamed: I address this defeating attitude in my book. Basically, you don’t need to be able to draw well to design well. In fact, art and design are different in many ways, even though they often rely on the same visual principles, such as color harmonies, contrast and unity. It is easier to learn and apply the principles of visual design than it is to become an artist. One key difference is that art is successful when it is perceived as beautiful or when it expresses the inner world of the artist. Also, art is open to many interpretations. On the other hand, a design is successful when it accurately communicates what the designer (or stakeholder) intended so that audiences understand it correctly. Kapp: What do you think instructional designers will gain the most from reading your book? Malamed: I had several goals when writing this book so I hope every reader will be fulfilled in at least one of these aspects. First, I am hoping that those readers who are very frustrated with visual design will be convinced that they can improve their design skills by applying the principles in the book, spending time in practice and becoming more aware of design in the world around them. Becoming a better designer is a lifelong practice. Second, for those who already have some skills and design awareness, I am hoping my book will help them fine-tune their craft by presenting the foundation principles they may have discovered but haven’t articulated to themselves. The more conscious the principles are, the more a person will be able to design in a way that facilitates learning. Third, I am hoping people can browse through the book for ideas and inspiration. There are well over 100 graphics throughout, and I’m hoping that the graphic examples and chapters in the last section will give readers ideas of how to approach all kinds of visuals, from icons to stories to graphs. Kapp: You have another book that you wrote a while back called “Visual Language for Designers.” How do the two books complement each other? Malamed: My first book, Visual Language for Designers, presents design principles based on cognitive psychology. It was written for a general design audience, which includes instructional designers. It focuses on how to visually communicate in a way that is aligned with our human cognitive architecture. The 250 graphics were gleaned from a worldwide audience of graphic designers and visual journalists. So you will see advertisements, brochures, information graphics, posters and the like. 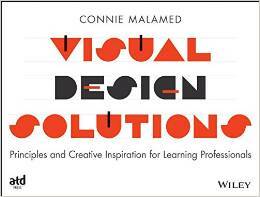 My new book, Visual Design Solutions, was exclusively written for learning professionals, which includes instructional designers, trainers, educators and even presenters. I discuss visual design principles in the context of effective learning and communication. The examples relate to eLearning, slides, performance support, etc. So the books complement each other in the sense that a thread of cognitive psychology and visual language runs through both of them. Kapp: What is the most difficult part of writing such a visually appealing book? Malamed: Probably the most difficult part of creating the book was producing or finding visuals to express so many different principles and concepts. It was also frustrating to not be able to present an example every time I wanted to. The book was getting long–it’s 384 pages–and I ran past my deadline, so I had to deal with the constraints of the medium, as we always do. Kapp: Any advice for graduate students just entering the field of instructional design from a visual design perspective? Kapp: Great thanks and remember everyone, check out Connie’s book. you can pre-order it here!